When you see the creative designs and carefully constructed watches in Invicta's I-Force series, you'll see why they're a force to be reckoned with. Bold stainless steel cases, bright dial colors with shiny finishes and luminous markers characterize the well-made watches in this collection. 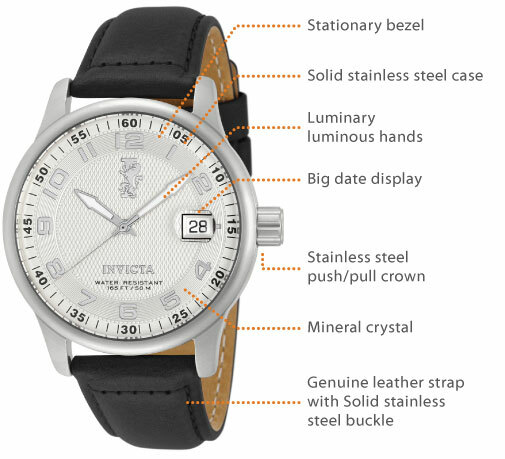 Fashion's take on vintage style, this leather strap watch by Invicta boasts a dressy look for the contemporary man. Large numbers and a 44 mm case are a modern approach to this classic timepiece. A revolutionary constitution by a democratic leading Force. Focused on an end to class antagonisms, the Invicta Force collection brings about change, and makes what was once in reach to only a few elite, affordable to all. Commanded by automatic or professional quartz chronograph movements housed within surgical grade solid stainless steel cases, leather straps, Trinite luminous hands, and submergible to 100 meters, the Invicta Force is prepared for war and ready for peace.